Advances in Liquid Crystals, Volume 2 covers the study of lyotropic and thermotropic liquid crystals. 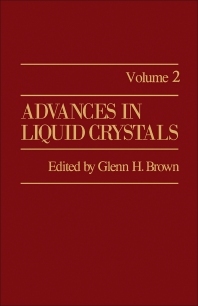 The five articles in this volume discuss topics such as the effects of change in molecular geometry on the properties of liquid crystals formed by nonamphiphilic (thermotropic) compounds; aspects of the physics and chemistry of cholesteric liquid crystals with respect to temperature dependence and temperature sensitivity of the selective reflection of visible light; arrangements of emulsifier molecules and the interaction between the different components in emulsions; the type of information about liquid crystals obtained from vibrational spectroscopy; and the continuum theory of liquid crystals as it applies to static equilibrium. The book will be invaluable to materials engineers, inventors, physicists, and researchers in the field of electronics.